While on a brief visit to the city recently I had a moment of deja vu so powerful that I thought I was hallucinating. Strolling northwards along Queen St towards Creek St I caught a flash of a sign saying "The Gresham", and pointing towards the Adelaide and Creek Sts corner where one of my favourite pubs from years gone by had stood, prior to its demolition in 1974. I ignored it, thinking that my mind was playing tricks. But then I decided to backtrack to see what might have triggered the imaginitis attack - and there it was - The Gresham, now a bar rather than a hotel. It seemingly had sprung up overnight, like a mushroom. I later established that it had in fact been there for a few months. Here is a photograph. 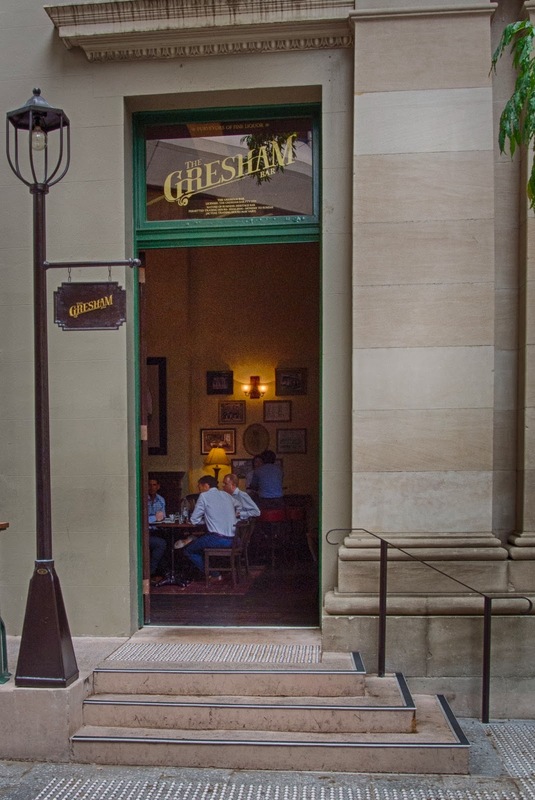 Situated on the ground floor of the NAB heritage building that stood behind the original Gresham, the bar extends outside into Gresham Lane that connects Adelaide, Creek and Queen. It seems to be Brisbane's newest laneway, and similar to those in Melbourne, this one is filled with coffee shops and cafes. The Gresham Hotel was designed by JH Buckeridge and built by Henry Holmes for £15000 in 1889-1890. The first licensee was Mr IA Phillips who also arranged the internal decoration of the hotel. I liked the classical design that made it look like an important government building, and I always felt that it was a bit more salubrious than the average inner-city pub. Here are a couple of photographs of it in its prime. 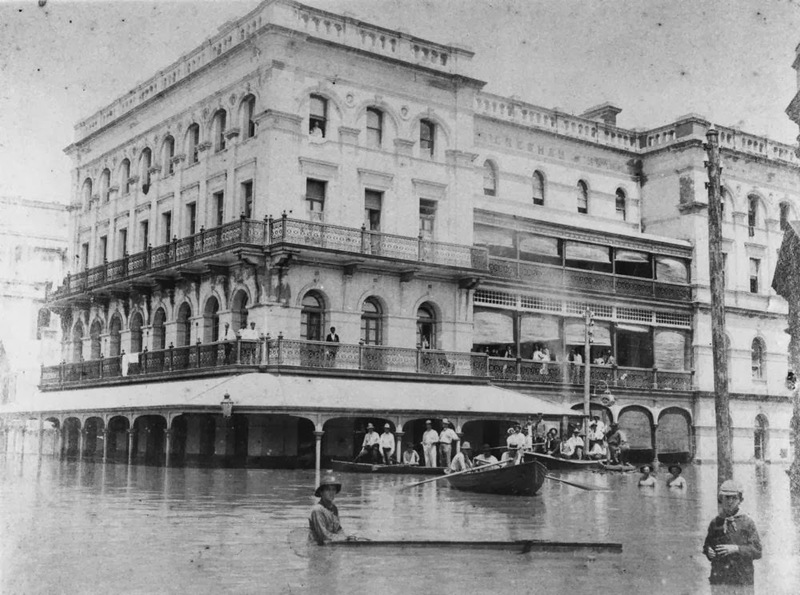 And the following image was captured during the enormous 1893 floods. Bear in mind that the hotel had been open just over two years when this disaster struck - I hate to think of the damage that the ground floor furniture and fittings must have sustained. My current photograph shows the modern structure that has been erected in its place. Not a patch on the Gresham in terms of style, I am afraid. At least the trees have softened the utilitarian exterior. The Gresham can lay claim to a couple of bits of history. The documents that incorporated Qantas were signed there in 1920, when Hudson Fysh, Paul McGuinness and Fergus McMaster met to inaugurate the airline. 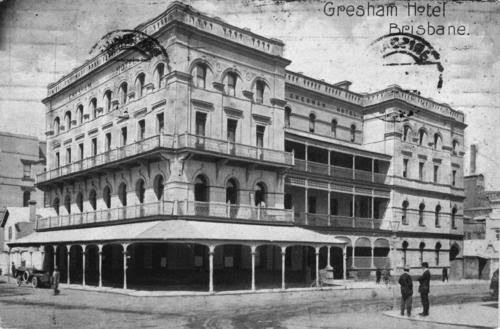 The Gresham was one of the earliest buildings in Brisbane to install electricity - it came from the power station that was erected in 1887 behind the GPO in what is now called Edison Lane - and the hotel was able to include the necessary electrical fittings during construction. 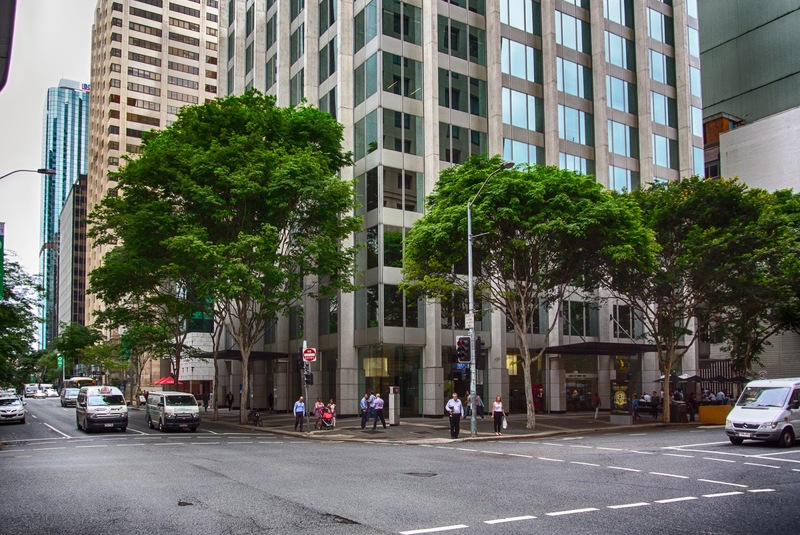 The hotel was also a player in the infamous 1942 Battle of Brisbane, where Australian and American service personnel locked horns in the intersection right outside the Gresham. Undoubtedly some of the antagonists would have been drinking there, but also the hotel's verandahs were a vantage point for many, including war correspondent John Hinde who was on a balcony overlooking the melee. He stated "The most furious battle I ever saw during the war was that night in Brisbane. It was like a civil war." Unfortunately another great flood dealt the final blow to the hotel. In 1974 the CBD was inundated again, and this time the Gresham was demolished in the aftermath to allow NAB to build another glass and steel tower in the CBD. That building is now known as 100 Creek St. This photograph of the front of the Gresham taken in 1973 shows that the facade of the hotel had already been altered and its appeal was lessened as a result.